"Tangerine is one of the best debut novels I've read in a long time. 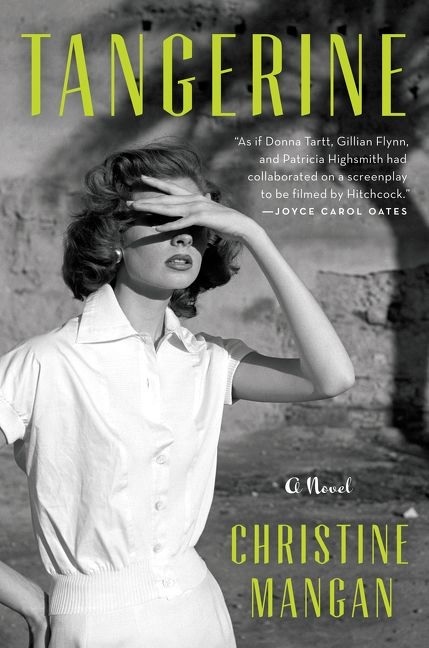 Thanks to her exquisite writing, Christine Mangan manages to create a lush, vivid picture of Tangier in the 1950s and bring to life a complicated and very dark friendship between two young women. Lucy and Alice are former college roommates whose relationship has long since gone sour. When they reunite in Tangier, Mangan milks the delicious tension for all it's worth and brings their story to a shocking conclusion. This book is an absolute stunner!" 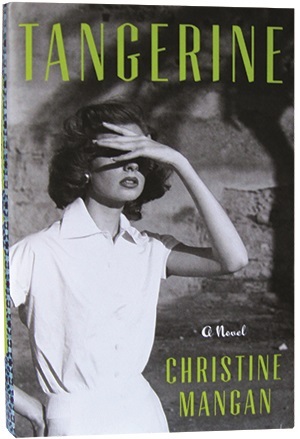 Indie booksellers have chosen Tangerine (Ecco, March 27), Christine Mangan's debut novel set in 1950s Tangier, as their number-one pick for the April Indie Next List. In Tangerine, young Alice Shipley is surprised when her former college roommate Lucy Mason shows up on her doorstep in Tangier, the exotic but intimidating Moroccan city she recently moved to with her new husband. But as Lucy's obsessive and controlling tendencies begin to reemerge, Alice starts to suspect that their strange friendship has become dangerous. Mangan has her PhD in English from University College Dublin, where her thesis focused on 18th-century Gothic literature, and an MFA in fiction writing from the University of Southern Maine. We spoke with Mangan about the city of Tangier's mysterious magic and the Gothic tropes that figure into her debut, which is also a Winter/Spring 2018 selection for the American Booksellers Association's Indies Introduce program. I had actually spent some time in Tangier right around the time I was finishing up with my PhD. I had been living in Dublin for four years while I worked on it, and I decided that instead of spending the last couple of months that I had on my visa in Dublin I would go and do a bit of traveling. For part of that, I ended up in Tangier; it was only for a little while, but it was a place that I had really wanted to go. I'd been to Morocco before and had gone to Marrakech and just passed through Tangier, so not knowing when I would get the chance to come back, I knew that I wanted to go and spend some time there. I'd been writing strictly academic work for so long and I wasn't necessarily thinking about a novel, but I was just so inspired by the city of Tangier that in the weeks and months afterward I found myself thinking about the city and the people I had met there, and from that I started to write the story that eventually became Tangerine. Your descriptions of Tangier in the 1950s are so vivid. From your experience and your reading, what do you think makes Tangier different from other cities in Morocco? There's something about Tangier that's not just different from elsewhere in Morocco, but different from anywhere. I think right away there are certain associations that people have with this city. It's a place where inherently there's a bit of mystery to it; it's a place where artists, in particular a lot of writers, have traveled or have made their homes. There is this certain romance to it. And when you get there, it can be so overwhelming as a place. There's an expression that I have in the novel, that you cry when you arrive and you cry when you leave. It's a city that requires you to engage and be present in a way that a lot of other cities don't. I think it's quite easy for certain cities to blend and blur with one another, but there's something about Tangier that just remains so separate and so distinct. It's also a place, maybe because it is so different, so unique, that creates a divide between people who go there, because some love it and some just find it too much and never want to go back. So I think it depends on the person, but it is this place for which there is no middle ground. I think the emotions it elicits in people are just so strong, and I've never really been anywhere else that is quite like that. You have a PhD in English, and your thesis focused on Gothic British literature. How did that influence the writing of this book? This is probably why I chose to set it in Tangier, because it needs such a big, unique, strong place. In the Gothic tales that I love and Gothic work in general, that is one of the things they all share: a strong sense of setting. With Jane Eyre, you had Thornfield; with Rebecca, you had Manderley. With Tangier, even though it is not this domestic space necessarily, you have these Gothic streets that can be just as frightening and, in some cases, threatening and ultimately as confining as any structure with walls. In my thesis, I wrote about the way these female writers of the Gothic in the 18th-century used the Gothic in order to talk about what they couldn't talk about otherwise, and to discuss the difficulties they experienced as women that were essentially allowed by 18th-century law and ideology. You have characters like Bertha Mason, who is this dark double to Jane Eyre; she is in some ways representative of the things that Jane can't say. It was this same idea with Lucy: In the beginning, Alice is unhappy in her marriage, and it takes Lucy popping up on her doorstep and staying for her to acknowledge the reasons why. Bertha Mason in Jane Eyre and Mrs. Danvers in Rebecca--these are women who are thought of as villains, but at the same time they are so much more complicated and there is so much more to them. So that was what I wanted to explore within Lucy as well, that she is not just inherently evil and inherently bad but had those other layers to her. The study of Gothic British literature deals with feminist themes like the pathologizing of strong, independent women and gaslighting. Did you consider these themes while writing? I did. I chose to set the book in the 1950s because in that time you still have a lot of these questions about identity and autonomy for women, and there is also that added layer of Tangier going through its own independence as well. So you have these two revolutions essentially happening at the same time, which was appealing to me. With the Gothic you have the female question, and then you have the French Revolution in the 18th century and how that influenced what people were writing about, these questions of change and what that might mean. The character of Lucy today might be characterized as a sociopath. Were you influenced by books like The Talented Mr. Ripley by Patricia Highsmith, or another version of "the psychopath abroad" type story? Yes, I love those type of stories, but I think what ultimately influenced me were stories about female friendship, like the French novel by Sébastien Japrisot called Trap for Cinderella. I wanted to look at those close bonds that we all create during our formative years, where boundaries are crossed, identities are blurred. I wanted this book to explore that moment when the friendship alters, when it starts to shift or crumble, whether it's because of the passage of time or the start of another relationship, and how that can feel like the end of the world. Lucy, in those moments, is reacting to that, but in that way it is also a nod to Gothic extremes or exaggeration. But it's also something that I think everybody has experienced. What are some of your favorite pieces of Gothic literature? I love Jane Eyre and Wuthering Heights. I love We Have Always Lived in the Castle--anything that Shirley Jackson has done, really. I'm also a huge Sarah Waters fan; The Little Stranger and Fingersmith are really great. Daphne du Maurier's Rebecca and My Cousin Rachel are some of my favorites as well. What has been the role of independent bookstores in your life? "This remarkable journey into mythology brings the ancient gods directly and viscerally into the present. Circe is a perfect mashup of elegant language, glorious storytelling, and exquisitely modern sensibilities. Miller's telling left me awed and moved by Circe and her story, all while wishing I could invite her over for a glass of wine on the porch. How this amazing author so perfectly melds the human and the divine, creating a story both immediate and epic, is dazzling." "I never could have anticipated this book, and now I can't imagine a world without it, especially at this moment in American history. The Female Persuasion follows the ambitious but shy Greer Kadetsky, her boyfriend, her best friend, and the feminist icon who launches her into the world. Through these vivid, complex, and lovable characters, Wolitzer explores both the principle and reality of feminism, as well as the desire to become our fullest selves and the twists and turns that journey can take. My heart raced while reading this book, and I never wanted it to end. The Female Persuasion is powerful, generous, smart, and deeply kind; I can't wait for the world to meet it." "Times have changed, women have changed, and, naturally, the experience of young(ish) motherhood has changed as well. I often tell people that becoming a mother was equal parts wonderful and abysmally dark and get blank stares, but here it is: a tale like mine, articulated with clarity and wit! I'm excited to be able to recommend this honest and relatable account of modern pregnancy and motherhood." "One hundred and eight: That's how many seemingly random predictions come to Will Dando one night in a dream. When they actually begin to occur, he starts selling his critical economic predictions to international interests and makes mountains of money. In the process, though, he also makes powerful enemies--not least of which is the U.S. government. When Will realizes that the dream wasn't as random as it seemed and is forced into hiding, what was almost a lark becomes deadly as he tries to survive long enough to counter the global chaos he's caused. With enough humor to lighten the seriousness of Will's predicament, this debut novel keeps readers guessing right to the surprising end." "The Overstory, which contains an energy like that of the trees that link its intertwining stories, is nothing short of stunning. Such links between the human and non-human are mostly hidden to us, but only because we tend not to look very closely (or prefer not to see). Powers' most beautiful sentences are also the most devastating, which hints at the novel's hope that death--whether of a person or a plant--is never quite the end that it seems. Until, that is, we look, or prefer, finally, to see. As we are instructed near the novel's end, 'What you make from a tree should be at least as miraculous as what you cut down.' Plainly put: The Overstory is perhaps as close to such a miracle as we currently deserve." "I've loved everything Leslie Jamison's written, but best of all so far is The Recovering, a memoir/history/criticism-hybrid that takes addiction and recovery as its subject. Every time I sat down with this book, I felt like I was in the company of my smartest friend, someone who knew all the right words for life's greatest pleasures and pains. Her book moves fluidly from personal remembrances to perfectly synthesized research into how and why people (herself and artists and others) elect to warp their consciousness with substances. The Recovering is a thorough and thoughtful look at many of our worst and some of our best tendencies, and Jamison's continually compelling style makes it a delight to read." "In the elegant and compelling prose that made Cold Mountain an award-winning bestseller, Charles Frazier brings to life Varina Howell Davis, the wife of the president of the Confederacy, Jefferson Davis. Varina is told in two voices: Varina's and Jimmie Limber's, the black boy she raises as a son and is forced to abandon as she and her children flee Richmond while the Confederacy crumbles. When Jimmie and Varina reunite years later and relive the cataclysmic events of the war years, they examine the morality and consequences of Varina's--and a nation's--choices. As great literature often does, this novel forced me to look at my own actions and attitudes with a more critical eye." "Country Dark spans 1954 to 1971, opening with Tucker's return home from the Korean War, where he had special training in killing other men, to rural Kentucky near the Ohio border, where he takes up a job as a driver in a bootlegging operation. Tucker is devoted to his rural home life and to his young wife and children, and once their way of life is threatened, he understands he may have to employ his wartime skills to keep it together. Chris Offutt's new novel is almost impossible not to race through, but it also must be savored for its artful but unpretentious phrasing, and for its many surprises, which we won't talk about here." "Chris Pavone's The Expats meets Amor Towles' A Gentleman in Moscow in this delightful novel. Scottie and Michael Messina are newlyweds when they arrive in Italy in April of 1956, where Michael is supposed to head up a new division of Ford. There is so much unknown between any typical pair of newlyweds, but Michael and Scottie harbor deeper secrets from each other, among them Michael's true occupation as a spy for the American government. Lynch evokes the period of the 1950s--Betty Crocker, Wonder Bread, and an entrenched distrust of Communism--in a story that froths with gossip and is sweetened by intrigue, stirred with the complex history of Italian and American relations. Delicious and positively drinkable." "A coming-of-age story about Andrea, a Midwestern, Catholic, artistic lesbian who escapes her family to try and find herself. After moving to Portland, Oregon, in the '90s, Andrea gets involved in printmaking and music, meets a circle of people she depends upon, experiences a breakup, and finds a new friend. I could not put this novel down once I started it. When I was down to the last 10 pages, I read as slowly as I could, savoring every last word about the people I had come to know in Stray City. Such a good story!" "Mike Muñoz is a broke, unemployed, sexually confused 22-year-old Chicano man living in Washington State, just trying to find the right path to his American dream. One setback after another is laid in front of him, and Mike wonders if he will ever make the leap from survival mode to working toward his goals. I loved this book for the sincere, engaging way the author addresses the issues of class distinction and cultural discrimination, and Mike is such a funny, tenacious, lovable human that you can't help but ache for his disappointments and cheer for his victories. I hope everyone reads this inspiring novel." "In a tightly composed piece of writing, novelist Lisa Genova carries the reader through the grim melody and turbulent sequencing of ALS while expertly relaying the gradual impact of the disease on the lives of patients and caregivers. With medical details balanced against the raw manifestation of the human experience, Every Note Played explores the cruel effects of loss and the profound effects of compassion and forgiveness. Richard and Karina are voluntarily alone, yet uncomfortably united by a sense of need and duty. Genova holds nothing back, producing a story that resonates with meaning and builds to a keen point of understanding." "The twists and turns of Scottoline's new family thriller kept me captivated as a reader, spouse, and parent. After Anna is the story of a family torn apart by the return of the wife's beautiful teenage daughter, Anna, who then is brutally murdered. With this event, Maggie not only loses her daughter, but her world is turned upside down by the possibility that her husband might be the killer. After Anna kept me guessing about who was telling the truth in this once-normal marriage. Scottoline is a master thriller writer, and her dazzling prose breathes life into her vibrant characters. Not only will the author's extensive fan base love After Anna, but new readers will enjoy it as well. I cannot wait to put it in their hands!" "I'm not sure I can prepare you for this book. I thought I knew what I was getting into, and a mere 140 pages later I landed on a different continent altogether. Noémi Lefebvre has produced a riveting story in Blue Self-Portrait, one that investigates the many variations of a thought, of a memory. Our narrator looks at her exchange with a pianist from every possible vantage point, arriving at both confusion and conclusion within the same second. Lefebvre is a master of the sentence, and some of these passages unfurl with all the introspection and music of Marcel Proust. Sophie Lewis' translation is a most welcome import into our canon that will be appreciated for its poetry and its audacity." "This haunting novel tells the story of a couple--two outsiders who find each other and fall in love--and the life they build as artists. After their daughter is born, a woman comes into their life to care for her, a woman whose life story is so poignant and heartbreaking that the couple cannot help but be inspired by it. But then boundaries are crossed, trust is betrayed, and lives are changed. This is a gorgeous, devastating book about belonging, art, and the choices we make." "In Wade in the Water, Smith masterfully makes herself into a medium through which the voices of other (forgotten) people can become poetry. 'I Will Tell You the Truth About This...' is a haunting and beautiful poem written using the letters and statements of African-Americans who enlisted as soldiers in the Civil War. Here, Smith is simultaneously the declarer and the creator of a space wherein others may be given room to declare. It is this balancing act that brings out the heart and beauty of Wade in the Water. The impersonal is made intimate, the world is made individual, and through it all, Smith guides us with true poetic sense. Wade in the Water is a necessary, beautiful book!" "In Paris, there is a bookstore called The Late Edition, where books are shelved geographically, and while readers can find any book by its story's setting, the store's proprietor Leah cannot locate her missing husband and searches for him throughout the city. In Paris by the Book, Paris is equal parts Madeline and The Red Balloon, the children's books that shape Leah's view of the City of Light. I'd compare Callanan's engrossing third novel to The Storied Life of A.J. Fikry and The Little Paris Bookshop, but with its confounding but ultimately loveable heroine, there's a bit of Where'd You Go, Bernadette in the story as well. This captivating novel is filled with rich characters, a twisty plot, a bit of mystery, and a heaping dollop of joie de vivre." "By far the best historical fiction title I've read in a long time! Not only is the story historically accurate, but the way it unfolds is unique and significantly adds to the plot and character development. Even though most readers today probably know how the book ends before they even start it, Ariel Lawhon's masterful storytelling will leave you cheering for or jeering at one of the Anastasias--which one is up to you!" "Anything Is Possible merges the interlocking story form of Strout's Olive Kitteridge with the characters from My Name Is Lucy Barton. No one captures both the decency and cruelty of small towns the way Strout does--the kindness of a school janitor, the merciless taunts an impoverished child must endure. The story of Mississippi Mary, about a woman visiting her mother in Italy, just might break your heart. Every story in this amazing collection is about the events that can make or break us--war, abuse, poverty, illness--and how we respond. I loved this marvelous book, and you should absolutely read it." "Emma is an apprentice baker in a small Normandy village during the Nazi occupation whose quiet determination to keep her friends and grandmother alive is heroic and heart-wrenching. Forced to bake ten loaves of bread for the Kommandant each day, Emma stretches her supplies to make extra loaves to help feed the starving villagers. While she refuses to think she is part of the resistance and has lost hope of the Allies arriving, Emma epitomizes the French spirit of survival. What a beautiful book to recommend to book groups and customers seeking a well-written story." "The unnamed narrator of Wang's winning and insightful novel is working on her PhD in synthetic organic chemistry, but the chemistry she really needs to learn is the one that makes relationships click. The prodigy daughter of high-achieving Chinese American parents, she's always strived to meet their demanding expectations. But when she has a breakdown and loses in both academia and in love, she finally realizes how angry she is. Coming to terms with her past becomes her next project, and soon she can see her parents in a new light--and they aren't the fierce tiger couple they'd always seemed to be." "Denny Malone, veteran NYPD detective and leader of the elite Manhattan North Task Force, didn't start out as a dirty cop. Over the years, however, the odd payoff and favor became routine, and a talented and effective cop slid past the point of no return, stealing millions in money and drugs. As Winslow shows us, keeping citizens safe isn't always clean and easy work, but even Malone and his team's corruption is chump change compared to the real players behind the scenes who are busy rebuilding the city after the September 11 attacks. A gutsy and uncompromising look at the dark heartbeat of modern America." "Perfectly paced and completely compelling, Girl in Snow by newcomer Danya Kukafka immerses you in a chilling small-town tale in which star high-school student Lucinda Hayes is found dead on a school playground. Most clues point to Cameron, an obsessed, window-peeping classmate who often lives in an 'alternate' state of mind. Conflicting clues come from the backstories of classmate Jade, the questionably motivated policeman Russ, and Cameron himself. Readers will be spellbound and remain puzzled as the characters expose the town's secrets. This is a not-to-be-missed story!" "As I consider the themes of memory and marriage in my own life, I realize that Dani Shapiro has reached across time to touch me with her insight and candor, and this is how Hourglass will touch all its readers. What a particular and original voice she has shared, reflecting on questions like, how are relationships formed? How does love burn and transform you? How does marriage, that age-old subject, play out between creators in the race against time? Through fragments, touching bits of memory, and poetic flights of fancy, this memoir honors the genre and elevates the form." "One of the most horrific chapters in American history is brought back to the national consciousness with alarming detail in Killers of the Flower Moon. After the Osage Indian Nation strikes oil, its members become rich beyond their wildest dreams, only to encounter a vast and murderous conspiracy that will leave more than 60 members of the nation dead. David Grann reconstructs those murders and the subsequent investigations with astonishing care and reveals the depths of a conspiracy that stretched from Oklahoma to Washington, D.C."
"Who better than the talented Anthony Horowitz to create this marvelous mystery within a mystery. Yes, we're treated to two mysteries for the price of one: One set in a peaceful village in England during the 1950s with the one and only Detective Atticus Pund taking the case, and the other set in contemporary times with a book editor who becomes an amateur sleuth. Horowitz pays tribute to the golden age of British crime with references to mysteries created by the likes of Dorothy Sayers and Agatha Christie. A perfect book to read in a cushy chair with a cup of tea (hot or iced)." "Tess and Gus first cross paths in Florence as 18-year-olds with their futures stretching ahead of them. Back in England, they live their lives oblivious to all the near-misses and chances they have to encounter one another again. The meandering way their lives circle each other is charming rather than frustrating, but the heart of this book lies in the choices Tess and Gus make as their lives unfold in ways neither anticipated. Exceptionally poignant and filled with relatable and deeply human characters, this is a thoughtful story about how you can never quite guess what life has in store for you--and maybe that's for the best." "The novels of Phaedra Patrick are good for what ails you! Rise and Shine, Benedict Stone is a charming novel about a dull British jeweler who finds new light in his life when his American niece springs a surprise visit on him. Gemma may only be 16 years old, but she is a catalyst for some much-needed change in Benedict's life and for the entire village. Readers would need a heart of stone to miss the joys of this delightful, feel-good novel. Book clubs are going to be taking a 'shine' to Benedict Stone." "This is one of the most engrossing novels that I've read in a while. It is ultimately a road trip through the beautiful haunted land of Bulgaria. An American woman arrives to teach English and inadvertently picks up the wrong bag while getting into a taxi. The bag holds a beautiful wooden box containing human remains. Her helpful, enigmatic taxi driver takes her into Bulgaria's unsettled present in search of the family that surely wants the urn back. This novel about self-discovery and historical reconciliation is thrilling, introspective, and very well paced." "This captivating story is set in a remote Yunnan village where, for many years, the Akha people have followed the rituals and cycles of harvesting tea leaves. Slowly, the changes going on in the rest of China begin to reach the area. Li-yan, one of the few educated girls in the village, acts as translator for a stranger seeking a rare tea from Yunnan. When Li-yan gives birth to a baby out of wedlock, she leaves her in a city where she will be taken to an orphanage. Over the years, mother and daughter dream of finding one another again. Brew yourself a cup of tea and settle with The Tea Girl of Hummingbird Lane."